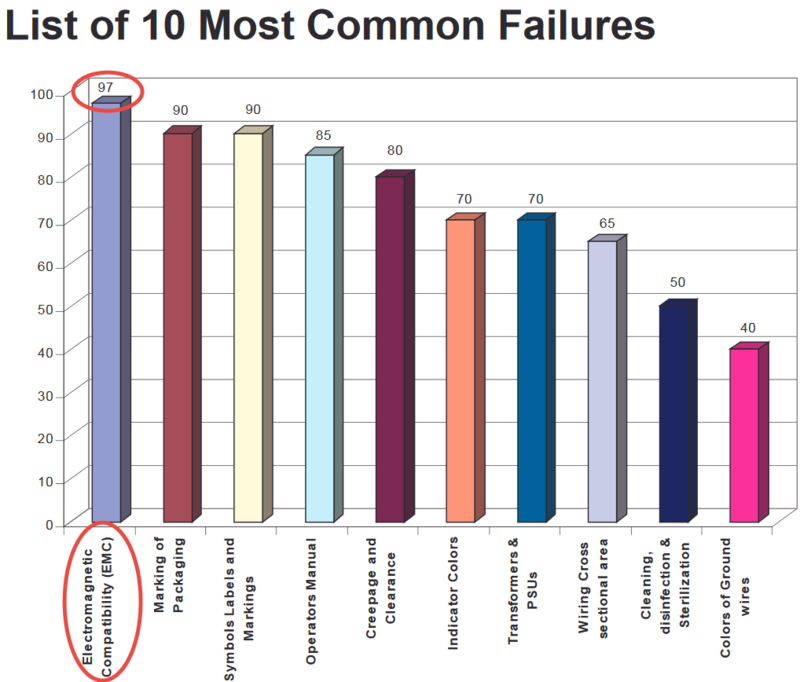 ﻿ What Percentage of Products Fail EMC Tests the First Time? What Percentage of Products Fail EMC Tests the First Time? Surprisingly, there is not much information out there about electromagnetic interference testing failure rates. It is surprising because so many products fail. A report by Intertek Testing Services, Boxborough, MA, estimates that 50% of devices fail EMI testing on the first try. Intertek, notes that after the initial 50% failure rate, between 5% and 7% fail retest, and 1% to 2% fail a third time. A second Intertek report states, “Over 90% of electrical medical devices that Intertek has tested have failed to comply with the required standards on the first submission.” The biggest reason? 97% fail EMC testing the first time. Intertek tests mostly consumer electronics and medical devices for compliance with European Union (EU) standards, CISPR22, CISPR24, and IEC 60601-1-2. Compared to the military, commercial aviation, and automotive standards, the EU standards are relatively easy to meet. First time EMI test failures for military, aviation, and automotive industries are probably higher. Unlike consumer and medical devices, military and aviation electronics are frequently interconnected in complex systems, so EMI test setups are more complicated, often requiring numerous cables and sophisticated test support equipment to simulate system operation. Automotive EMC requirements are significantly more stringent than their consumer and medical counterparts, and automotive cables are rarely shielded, making compliance more challenging. What Causes EMI Test Failures? The first three bullets are a no-brainer. If you do not know anything about EMC, or worse, you do know something, but you do not use what you know, the outcome is probably not going to be favorable. Likewise, if you design to the wrong EMC regulations, you may not like the results. The fourth and fifth bullets are preventable if you use EMI Analyst™ software. If you add an EMI filter to your design and then run an analysis with EMI Analyst™, you will know whether you have selected the right EMI filter because you will be able to see whether your equipment is predicted to pass its EMI tests. EMI test failures caused by unpredicted interactions are preventable. How? Predict the interactions! EMC test failures are often the result of resonances. Circuit elements have self-resonance, components resonate with other circuit components, and components resonate with electrical cabling. Some of these interactions are unexpected and can be quite significant. For example, a ground wire connected to box chassis at one end and the test bench ground plane at the other may produce out-of-spec radiated electric fields at its resonant frequency when excited by only a few hundred microvolts. Using EMI Analyst™ the resonance is predictable. Many EMC test failures occur because little or no EMC analysis is done during design. Use EMI Analyst™ to predict and prevent EMC test failures. For more information about preventing EMI test failures, see the EMI Analyst™ product pages.